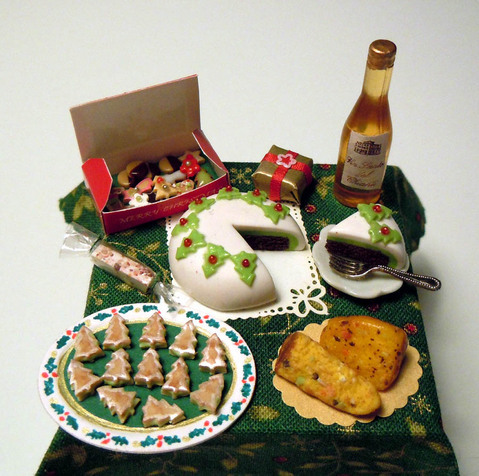 On this miniature Christmas table, everything you need to celebrate a merry Christmas! A big chocolate cake decorated with green Christmas trees, with a slice on a plate ready to be eaten. Two big slices of italian Panettone on a paper doily, Christmas trees biscuits filled with green cream on a decorated oval paper tray, a paper box filled with mixed cookies and candies, a nougat wrapped in plastic, a little gift and a bottle of Chianti wine. Three handmade wooden display boxes, painted in white or red and full of Christmas treats, each one with a nice Christmas vintage picture. 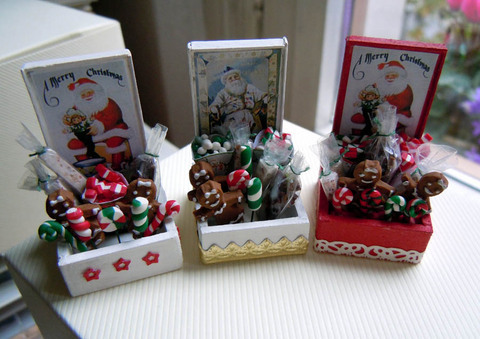 Inside each display box you'll find mixed candies, including green, white and red Christmas lollipops, gingerbread girls, paper cones full of red and white candies, plastic bags with mixed biscuits, some nougats, candy canes. Each display box is decorated with a different elegant decoration on the sides. Perfect for a candy shop or for your dollhouse to celebrate Christmas!